Donald Trump's daughter Ivanka was met with groans as she defended her father's attitude towards women at the G20 women's summit in Berlin. But the audience bristled at her praise for the US president. The event is part of the G20 women's summit. Ivanka Trump: America's first daughter? An audible groan went up as she told the room her father was a "tremendous champion of supporting families and enabling them to thrive". 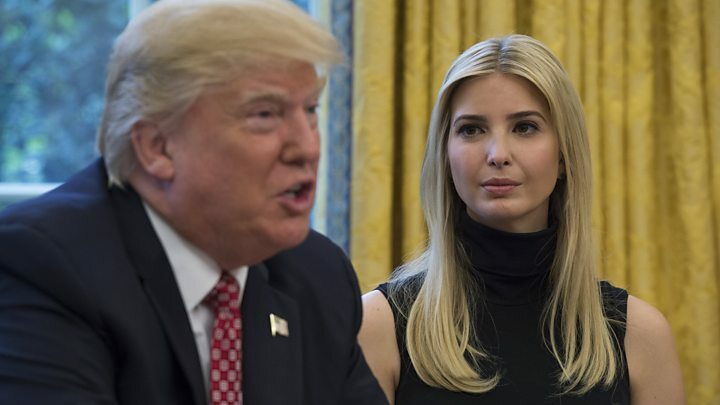 Media captionIvanka Trump's prominent role in her father's administration is seen as a positive thing by many young women. But Ms Trump said that although she had "heard the criticism from the media and that has been perpetuated", she did not recognise her father in the description and nor would the "thousands" of women he had employed over the years. "He encouraged me and enabled me to thrive. I grew up in a house where there were no barriers to what I could accomplish," she added. Image caption Ms Trump said her father "encouraged me and enabled me to thrive"
As she posed for photographs with the world's most powerful women, the first daughter rubbed shoulders with a chancellor, a queen and a leading banker. But it was the absent figure of a president that overshadowed Ivanka Trump's first official overseas engagement. Ignoring the boos, hisses and disapproval of a room full of female delegates, Donald Trump's special adviser persisted in her defence of a father who, she said, had enabled and encouraged her. Ostensibly today's visit - at the direct invitation of Angela Merkel - was about empowering women. But it's been widely interpreted here as an attempt to forge another line of communication to the US president, and may mark a profound shift in the way in which Berlin - and Europe - does business with Washington. Thus far the charm offensive seems to be working. Despite their significantly different politics, Mr Trump has said that he shares an unbelievable chemistry with the German chancellor. The relationship Mrs Merkel forges with his daughter will be closely scrutinised on both sides of the Atlantic. Because there is an acknowledgement in Berlin that, in the age of Trump, family comes first. Mr Trump tends to blame the media for negative portrayals of his character or presidency. It remains unclear what exactly Ms Trump's role is within her father's White House. In March, it was announced that Ms Trump - who joined her father's business a year after graduating from university - would be an unpaid assistant to the president. She and her husband Jared Kushner are seen as increasingly influential, however, and German newspaper Berliner Zeitung said officials hoped "the president's daughter will convey a positive image of Germany to her father as a result of her short visit". Mrs Merkel invited Ms Trump during her trip to Washington last month. 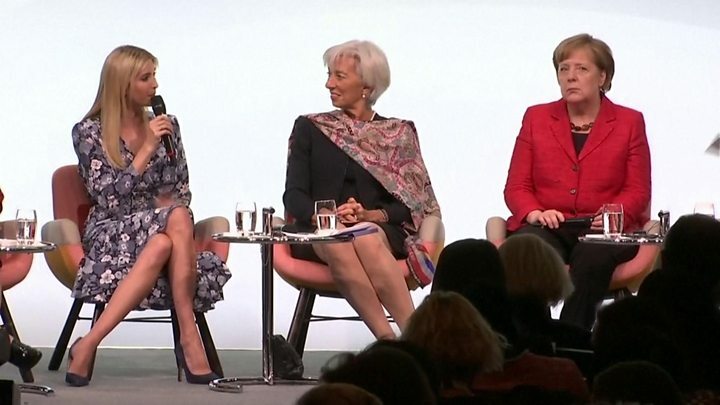 Ms Trump has spoken repeatedly about the need to empower women professionally, including in an opinion piece for the Financial Times ahead of her visit to Berlin. Ms Trump was on the stage thanks to her background as a businesswoman and her position as the US president's daughter. But who were the other women? Angela Merkel: The German chancellor is arguably Europe's most powerful leader and has been active in politics since the late 1980s, when she completed her doctorate in quantum chemistry. She has been in power since 2005 and is seeking re-election later this year. Christine Lagarde: The head of the IMF is the first woman in the role and previously served as France's finance minister for four years. Before that she spent more than two decades working in law. She also has a number of masters degrees. Queen Maxima of the Netherlands: The Argentinean-born royal worked for some of the world's top banks before meeting and marrying King Willem-Alexander. She is also a UN Special Advocate for Inclusive Finance for Development. Chrystia Freeland: Canada's Minister of Foreign Affairs studied Russian history and literature at Harvard and has a master's in Slavonic studies from Oxford. The author of two books, she turned to politics after a successful career as a journalist. Juliana Rotich: Kenyan-born Rotich used to be executive director for Ushahidi, an election mapping platform which was used to track possible voter intimidation in the US election. She now describes herself as a strategic advisor and entrepreneur. Anne Finucane: Ms Finucane is vice chair at Bank of America, and was named by Fortune magazine as one of the 50 most powerful woman in the world last year.